Using their own version of the counter rotating dual prop system for boat propellers Suzuki started working on a new outboard motor project over three years ago. The Mercruiser and Volvo Penta stern drives have had their twin boat prop systems on the market for years and Yamaha also had their VMAX one hundred and fifty horsepower TRP outboard that used two props but they no longer make the TRP. 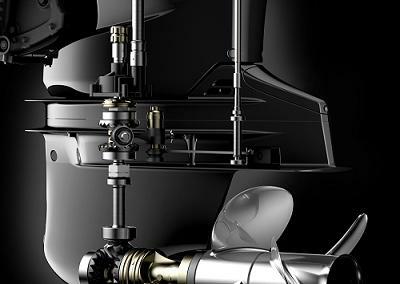 The new three hundred and fifty horsepower four stroke engine is Suzuki’s most powerful engine they have ever made and it is loaded with innovative design features besides the two boat propeller propulsion system. This engine has a 4.4 liter V-6 powerhead with a highest outboard motor compression ratio of twelve to one for more powerful torque performance. The gearcase was able to made slimmer for less drag and better flow of water to the boat props by moving the shifting mechanism to the top part of the case. This gearcase design is far different than any other gearcase design offered by other outboard motor manufacturers today. The prop shaft turns both boat propellers in forward and reverse and uses a single pinion gear to turn the shaft. The DF350A weighs in at about seven hundred and twenty five pounds, just under ninety pounds more than the three hundred horsepower Suzuki. The DF350A holeshot is extremely quick thanks to almost double the propeller blade surface area it has compared to single boat prop outboards.This Suzuki lifts the stern of larger heavier boats very well for faster planing. It also performs fantastic in turns with very little slippage and overall gas mileage is excellent also because of less slippage. Pricing on the DF350A is in the thirty thousand dollar price range.